View of my rug, from the couch. Here sits my big hit or miss rug, on the frame in my living room. On the border, I had just turned the last corner of the oval, ready to hook down the last long side and to the finish. But there it has sat, not one loop pulled, since I came down with a bad case of the flu a week ago. I think it is safe to say that the flu is the absolute opposite of creativity. In the long hours and days of lying on my couch, I look up and see the rug, untouched, right in front of me. And in my hazy-headed, woozy-minded state, I can still find a little comfort in gazing at the blocks of hit or miss. Sometimes, I will start looking at the rug, picking out one color at a time to consider – all the places I put in yellows, or lavenders, or blues. Sometimes, I try to remember having hooked that brown plaid in next to that deep maroon, next to that piece of sky blue. 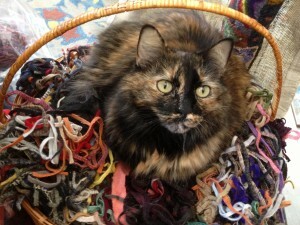 Of course, I can’t now actually remember picking out and hooking in those specific pieces of wool. But as I lay on my couch, I know I did pick those pieces out, and hook them in next to each other. And in the dream-like haze of the flu-sufferer, I am finding solace in looking up and gazing at my rug, and its dancing patterns of color. One of these days I will feel better. 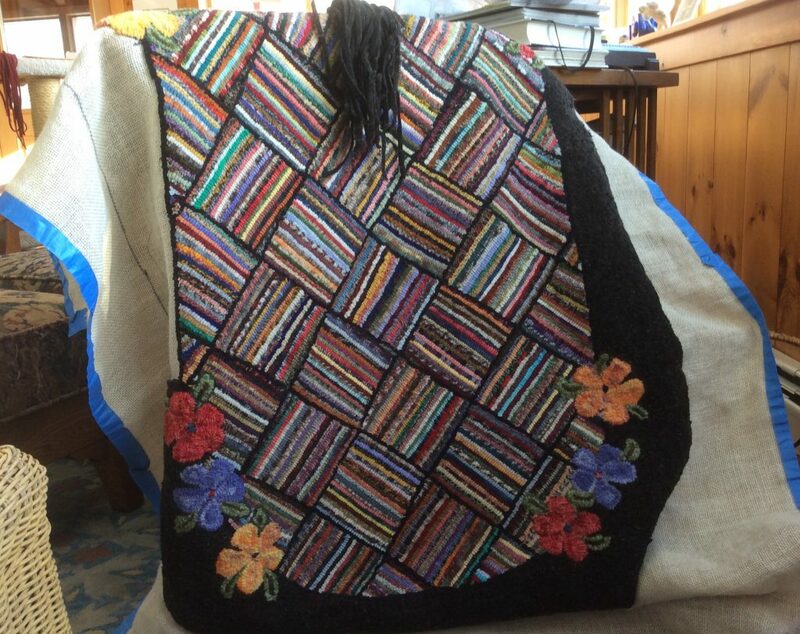 One of these days I will finish this rug, and be feeling excitement about the next one. One of these days, I will write a real blog post again. But not today. My website and blog are back, once again thanks to Jakob Ollén, master designer! 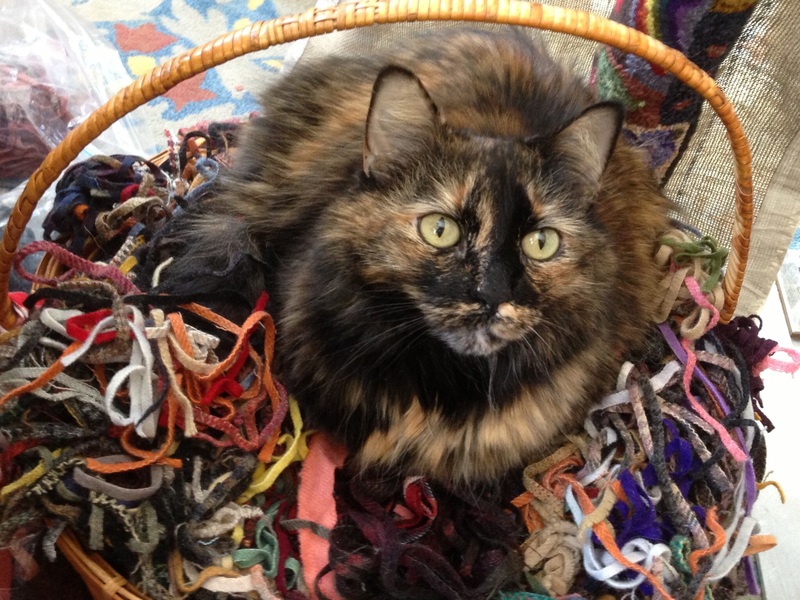 I thought I would let Ruby the Cat welcome you back, since she spends so much time watching me hook, and sitting in my baskets of wool. There will be a few tweeks left to finessing the site design, but once you and I get to know our way around, this will be a great improvement, I think! For one thing, I am writing this post on my tablet, not having to sit in the back room where my desktop is! There will be a way for you to get new posts emailed to you, or just to follow the blog on your reader. And all of the 2+ years of older blog posts, on rughooking, color, design and life, are again at your fingertips, in the archives. Thanks so much for finding, or re-finding my blog. Whee!